Book now for a workshop with professional tapestry artist Julie Taylor exploring original design making and interpretations for woven tapestry. Techniques will incorporate innovative 3D and textural methods. Create your own individual design suitable for tapestry weaving using the work of Louise Bourgeois as inspiration. 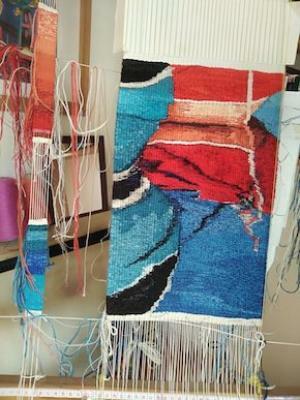 Develop design skills and 3D tapestry methods. Use textiles that have personal meaning or memories associated with them thinking about the idea of association and emotional investment in worn garments. Julie Taylor has background in Fine Art, teaching and a love of textiles. She has been designing and weaving tapestries for many years. Her ideas develop from drawings and sketches of colour and shape. Saturated colour has an important place in her work and she believes that we are all enriched and drawn to certain colours. Tickets are £50 (£40 concessions), booking is required. The booking fee includes lunch.